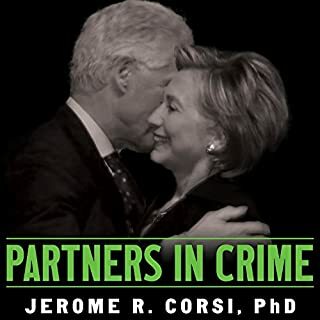 In Partners in Crime, two-time number-one New York Times best-selling author Jerome R. Corsi, PhD, presents detailed research and expert testimony proving beyond a shadow of a doubt that the Clinton Foundation is a vast criminal conspiracy. Excellent review of the " ultimate insiders" Bill & Hillary. The depth and research of "Partners in Crime" by Jerome Corsi is extensive. He reveals the true nature of the Clintons. Left to themselves, and with the power of another term in the White House they will surely destroy our hopes for truth & justice. Along with giving up our nation's sovereignty. It is up to Voters to inform themselves and in so doing protect what God has given to us the "Rule of Law".